Our place is in one of bays on the east side of the upper part of the lake. We’ve been there for ten years now. This is the first year we’ve noticed some erosion at the water’s edge. At first we thought it might be a muskrat. Actually it might be. But it also seems to be that speedboats and jet skis come into the bay and create wakes a lot more than they used to. We decided to try a natural border at the water’s edge to see if maybe some hardy grasses and whatever popped up might help. The alternative, a rocky divide or a breakwall requires permits. A true natural shoreline is a wonderful goal and we might try it in the future. 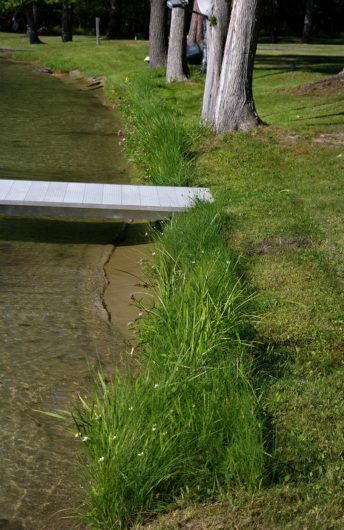 Check out the Michigan Natural Shoreline Partnership. But there’s a neatnik in our family and she might have a hard time leaving everything all natural and messy. We are very careful, though, that we don’t end up putting chemicals in the lake. We don’t use weed killer on the lawn. Actually, if we did we’d mostly not have any lawn. Especially this dry summer the weeds were about the only green stuff in the lawn. And we even powerwash the house and docks without using any soap in the powerwasher. Even the biodegradeable kind takes more trust in chemistry than we have. I’ll be darned. Look at all those wildflowers.If there were a wildflower that put fear into Canada Geese it might almost be perfect. Steve picked a bouquet of wildflowers and a number of them came from our little slice of natural. 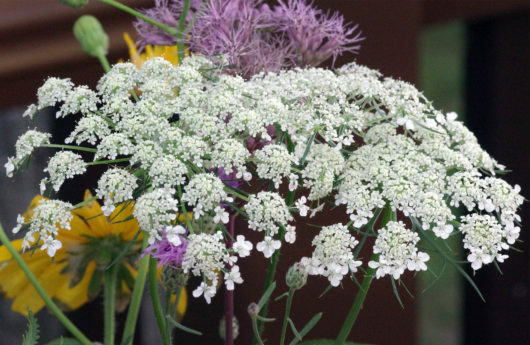 So, it looks like Queen Anne’s Lace. I’m no gardener, but I don’t think it it is. I think it’s actually Water Hemlock, with its plant clusters squashed some to fit into the vase. 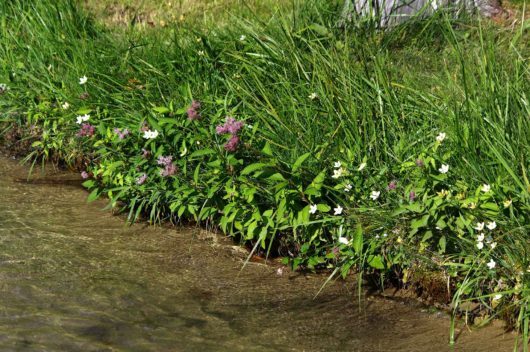 Water Hemlock is a perennial native plant. Common in wet pastures and along roads and ditches. It’s a member of the carrot family and has a long taproot that smells like a carrot and tastes like a carrot. Except, if this really is Water Hemlock, don’t be tempted. 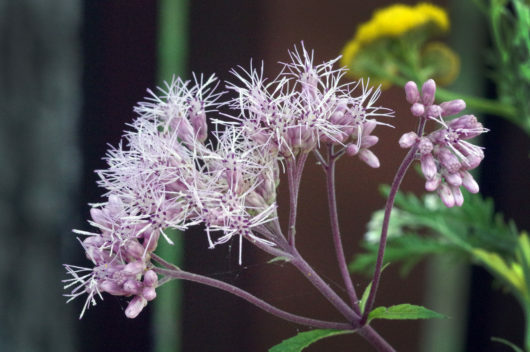 It’s described by Stan Tekiela in his book on Michigan wildflowers as “by far the most poisonous plant in Michigan.” Something quite like this did in Socrates and you don’t want to go that route. A more benign identification is that it might be Water a/k/a Cow Parsnip. Nah. I like the Water Hemlock ID better. 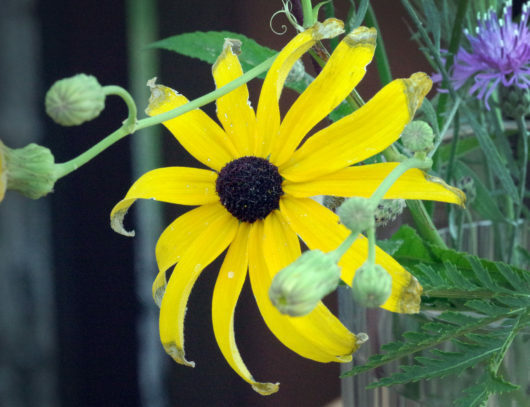 This big yellow guy, with some of its glory faded, is a Black-Eyed Susan. I think. Some call her Brown-eyed Susan, which would be more appropriate. Susan is in the Aster family. Nobody seems to know who Susan was. Or why this sunny plant bears her name. 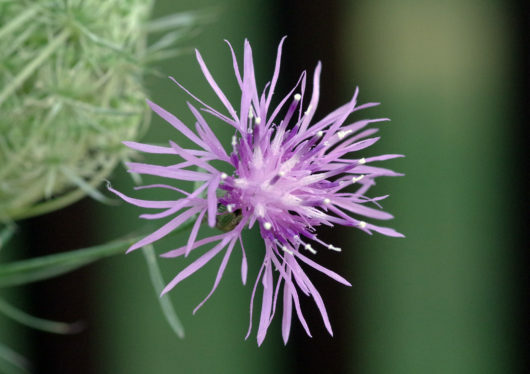 This purple delicate flower is another tentative identification: Spotted Knapweed. If so, it’s a non-native nasty. It aggressively crowds out other plants and may even change the chemical nature of the soil to keep away the natives and favor its own seeds. That would make it an allelopathic, a plant that releases toxins to inhibit the grown of plant competitors. Steve managed to find one of the prettier views for photographing this one. The bract under the flower, that sort of holds the flower in place, is a primitive looking ugly thing. This one, I believe, is Sweet or Spotted Joe-Pye Weed.There are a number of Joe Pyes in Michigan. They are a native plant. As the flower buds open, these small, fuzzy-looking delicate blooms appear. They are are hardy plants and the bloom lasts a long time. So, who was Joe Pye? All of my flower books say Joe Pye was a Native American “medicine man” in the 1700’s who travelled around New England teaching the settlers about the medicinal use of native plants. Joe Pye said his weed was a cure for typhoid fever, kidney stones, burns, and inflamed joints. The one flower Steve and I know for sure is Dandelions. We are experts on Dandelions. So, I don’t think he was picking Dandelions for his bouquet. I’m not sure about this one, but I think it’s a Common Sow Thistle. Sonchus Oleraceus. They are common along roadsides. Their stems flow with a milky juice. But Steve doesn’t remember if the thing slimed him or not. Next up is the lovely named Yellow Goat’s Beard, another member of the Aster family. 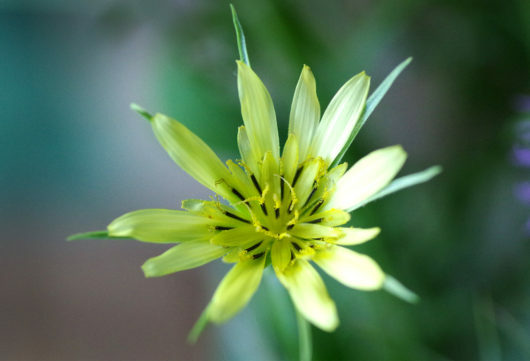 They also go by the name of the Western Salsify. Who the heck makes up these names? We caught this one at just the right time. 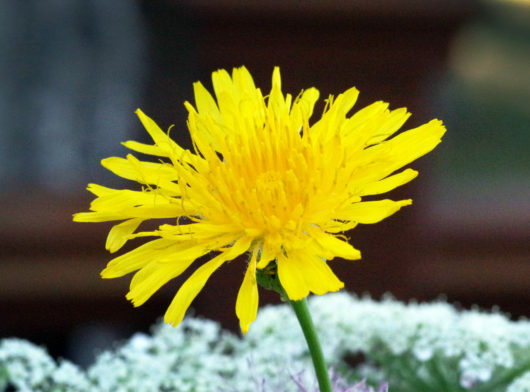 The flowers soon turn into fluffy big globe-shaped seed heads, like dandelions, and that’s how this plant spreads. Those little clusters of yellow flat button flowers are Common Tansy, Tanacetum Vulgare. It’s another member of the Aster family. I like their nickname: Bitter Buttons. Apparently its leaves have a strong bitter smell. I have quite a few allergies and decided not to do too much sniffing around the bouquet, so I can’t personally verify that. It’s a non-native. One of its folk uses is for, ahem, ridding folks of intestinal worms. It’s worm-fighting prowess is maybe why it was packed in funeral winding sheets and why people would get buried with tansy wreaths. My goodness. 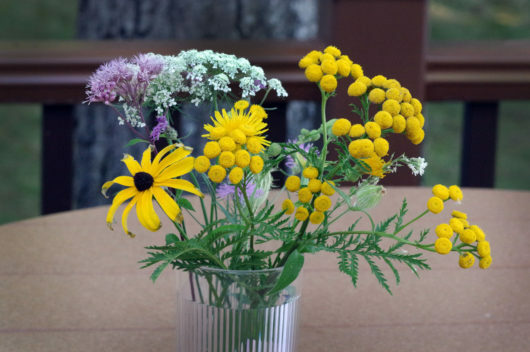 After this research we may leave the Common Tansy out of future bouquets. Also the Water Hemlock. Definitely the Water Hemlock.